After you have read your students The Lorax, you can do this food chain lesson plan. First, ask students which plants and animals in the Lorax's world are affected by the Once-ler's thneed factory? You also might want to discuss with students what resources and products that are in the real world are similar to the products, resources and animals in The Lorax. It will help them to make the connection between the book and food chains if you have them start finding similarities from the beginning. For example, truffula trees could be like the kapok trees in the rainforest. Your students will be able to find many similarities with forests and the setting in the book for this food chain lesson plan. Then discuss with students what will happen to the brown bar-ba-loots once the truffula trees are gone and there is no more fruit? (They leave to find food–this happens in the book.) Then ask students: "What will happen to the truffula tigers?" Students should answer that these animals might also have to leave because they can not find food if the brown bar-ba-loots leave. In this food chain lesson plan, you will also want to discuss with students reasons why animals may have to leave a habitat or why a food chain is broken. For example, in The Lorax, the humming-fish have to find another pond because theirs is too polluted. Thinking about a food chain, what animals might be affected by this move? 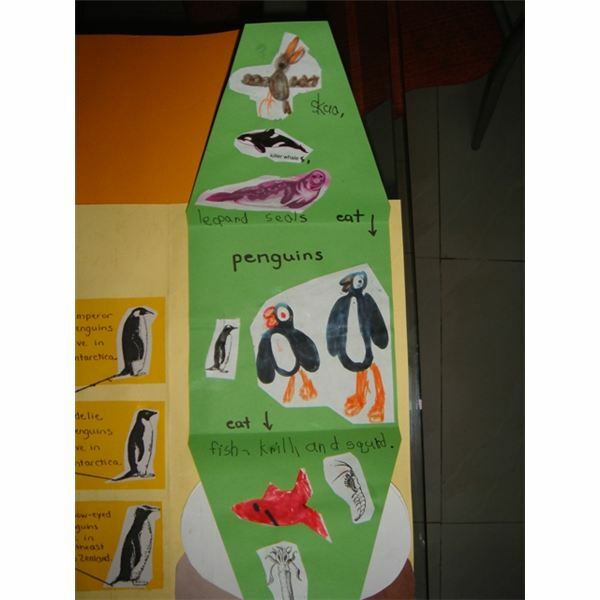 The students can make up animals since Dr. Seuss does not mention this, but basically their answers should reflect that animals that eat the fish will have to find new food or leave also. Ask students if pollution from factories ever affect food chains in these habitats, and the students should answer yes. Discuss ways these food chains are affected, especially from cutting down trees to make products, building houses on the land, or oil spills. Next you will be teaching food webs in the real world since habitats are made up of many food chains put together. From reading and/or listening to The Lorax by Dr. Seuss, students should understand that habitats are not as simple as food chains. Many animals and plants are dependent upon one another and are affected if one plant or animal is affected. When you are teaching food webs, you will want to give students a definition such as, " a food web is the interconnected food chains in a certain environment or habitat." For example, in the food chain listed above (grass, rabbits, foxes), there are more animals that eat grass in the forest besides rabbits. Deer also eat grass and live in the forest. Therefore, if grass was in the middle of a food web, deer could come off one side and rabbits could come off the other side. What eats a deer? Humans or wolves may eat a deer, so they would also be in this food web. Ask students to brainstorm other animals that eat grass. Then on the board, you can make a food web, with grass as the center. To make an even more complex web, you could ask students what animals eat rabbits besides foxes. Then there would be another branch coming off of rabbits. Coyotes eat rabbits, and so they are added to the web. When teaching food webs, students should see that there are many food chains connected together. They should also see the shape of a "web" to help them visually understand the difference between a food chain and web.